Sorry I never got a post up this past weekend, life has been very busy at the minute - I feel like the days just merge into one! But today I thought I would share with you a little life saver I have recently found, which has been perfect to give me a tan, quick and easy especially when you feel like you have no time but want a pick me up! 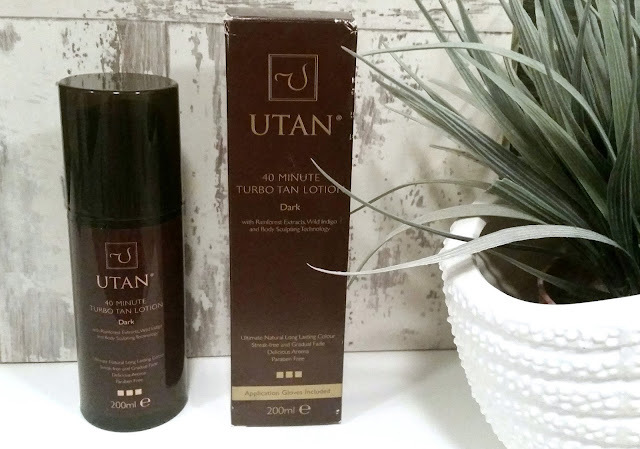 I recently discovered this Turbo Tan by UTAN - I had seen this brand before but never really looked to purchase it - that was until I saw this is a 40 minute tanning lotion! The product states that you apply and leave for 40 minutes, shower it off and it will continue to develop. I was a little apprehensive at first to see how this would work, but as I am all for those quick, easy products I had to give it a try! First off I want to point out I did purchase dark as I like a deeper tan and something which will go on evenly but last a while and give a good colour. However, WARNING: Don't plan on leaving the house in the 40 minutes this tan is on and developing! I was surprised and nervous at how dark this tan actually was but as it comes out a deep colour you can easily apply and see where you are putting it to avoid leaving those dreaded patches on the skin! The first thing that I noticed when applying was the smell, it was actually really nice - not like the usual fake tan smell and when it was on the skin it continued to have a nice smell which I have never found in a tan product. I normally leave this around an hour then jump in the shower and rinse it off and although it is very dark it does rinse out and leave you with a nice even and bronzed tan, dark enough that you can leave it at one coat! I would say the colour that you have on your skin when you rinse is the colour you are left with, I haven't noticed a huge difference in the developing hours later but the colours is great just the way it is! I was really impressed with how this product works, I can put it on in the morning, make breakfast then go back and wash it off and you have a beautiful tan in such a short time! The only downside was after a few days when the tan starts fading it doesn't fade as easy as the St.Tropez and you do need to make sure you give yourself a good scrub to remove the remaining product! All in all it is definitely a product I recommend and can't believe I didn't find it sooner, for all you tan lovers out there wanting something quick and easy - try this, I'm sure you'll be blown away just like I was! Happy Easter | 100th Blog Post!